When I play passages that require higher positions on the e string, it sounds okay until i go higher up on the finger board. It becomes very hard and difficult for me to press down all the way, and when i do, it sound like a bird trying to chirp but failing. How do i fix this? Also, is there any chance you've got a really heavy/stark tension/gauge e string mounted? Or a particularly old one? Or a wound one? Does this happen in the G string as well? Any chance of an incorrectly scooped fingerboard? Many strings could possibly work without been pressed all the way down to the fingerboard, especially e strings "up there". Up there, I relocate my fingers according to where my thumb rests to "find my way" and avoid getting lost. And sometimes, all it takes is a little pressure on the string maybe without touching the fingerboard in those really really high position, depending on the string, the player and the instrument. The weird sound you mention, could be caused by the string being pressed over it's limits. You could experiment with your bow contact point, and play where it feels less tense, and see what happens. Is your bridge too high for the fingerboard? My previous violin had an absurdly high bridge that, whenever I tried to go above first position (or heck, even IN first position), the strings would cut into my fingers any time I'd press them. 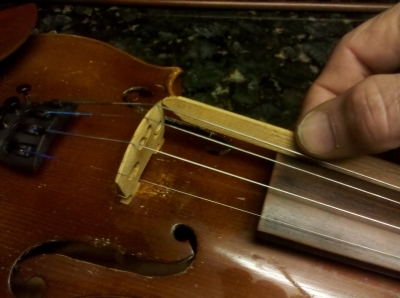 I didn't know it at the time, but I'm pretty sure somebody just ordered a standard bridge and put it on the violin without even carving or sanding anything down to make it fit the instrument. If you can, take it to a luthier and see what they have to say. Otherwise, you might just need to develop some calluses on your fingertips (gah, what a painful procedure!) and work your way slowly up to the higher positions. Still, hope the luthier can fix whatever's the matter!! 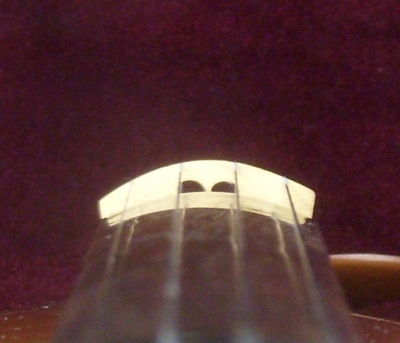 I second what ladyeclectic said, I have one violin like that with a way to high bridge and going up in an even slightly higher position like 3rd just sounded awful, I only recently found out (thanks to this forum) that the bridge was to high. I now have a second (cheapy) violin and the bridge is much lower, doesn't hurt my fingers as much and it sounds better also. String height is a function of bridge height, plain and simple. Some violins are built rather quickly and not necessarily correctly. It takes me about and hour to make a bridge so it isn't something to take lightly. Even after making it, I still usually spend a few hours playing, analyzing, and modifying them. I have a stick I use that is 3.5mm on one side and 1.5mm on the other side. I use that to mark the edges of the bridge and then draw a line using my 42mm radius gauge to connect the dots, and that is the proper angle or curve for pretty good string height. I like the stick idea. The stick is a great method. We use a longer stick, similar to Dennis's that lays across the whole fingerboard and has millimeters on the end. Mark the E and the G, take off the bridge (bridge jacks are handy for this) and use a template. The template can be made using a standard bridge curvature, or copy the fingerboard curve, or the curve that you already have on your bridge providing you like it. The curve is based very much on personal and individual preferences and experience. Be cautious not to bring the G too low as there is a risk that the string can vibrate against the fingerboard when playing. 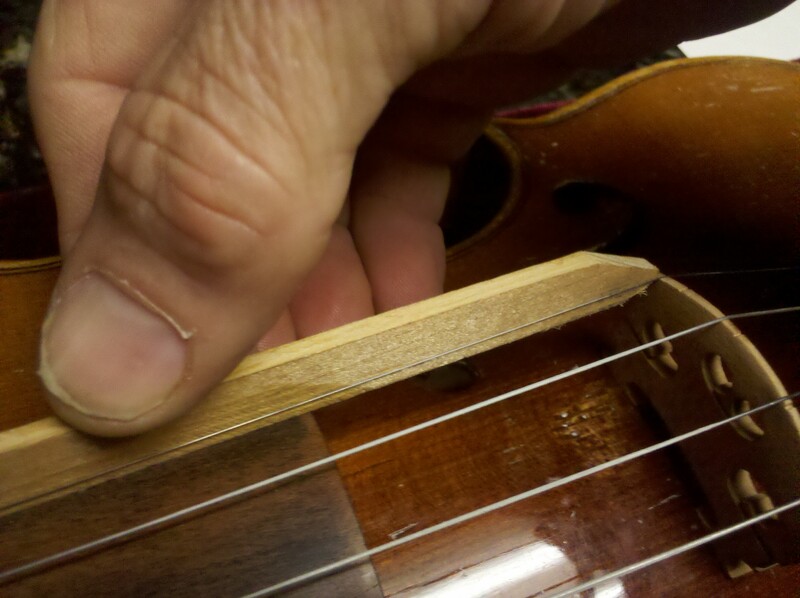 Lastly, the nut height and fingerboard shape plays and equally important role in the final adjustment.